The December update for ArcGIS Online is just a few days away, rolling out from midnight (US time) on December 4th. There is a lot of useful functionality packed into this release, including some user interface updates, changes to administrative workflows, but most significantly, the licensing model has evolved to introduce the concept of ‘user types’. Currently, capabilities and identity are determined by user levels (Level 1 and Level 2) licensing, allowing ArcGIS Online members to view content or have access to all capabilities within ArcGIS Online. In order to provide a wider variety of capabilities and apps, Esri have introduced three additional user types and have changed the terminology used to describe users. User types are a combination of identity, capabilities and apps that align with the needs of typical members in an organisation. There are now 5 user types named user licenses that allow organisations to tailor the capabilities and apps available to different members based on their working needs. User types are the building blocks to creating members within your organisation and are replacing levels. Organisation members are described by a word (such as Viewer or Creator) that defines their capabilities and work tasks. Existing Level 1 named user licenses will now be known as Viewer licenses and Level 2 named user licenses have become Creator licenses – any current Level 1 or Level 2 users will not notice any changes to their experience or entitlements after the upgrade as the new types are exactly equivalent with the previous levels. There is now also a concept of included apps and add-on apps. Included apps are app licenses that come as part of a user type. Included apps cannot be re-assigned to other members and are available to members as soon as their account is created. 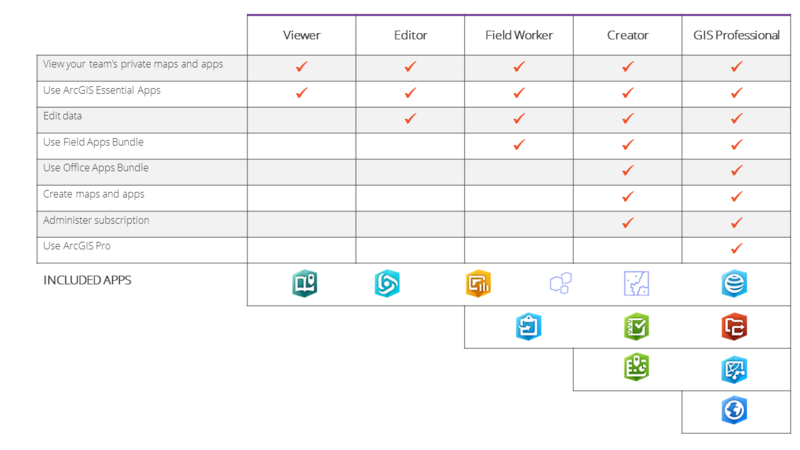 If members need access to apps that aren’t included with a user type, such as Insights for ArcGIS, these apps can be assigned to a member’s identity as add-on apps, providing additional flexibility to organisations that need it. Add-on apps can be re-assigned to other members. We understand the User Type model will provide a more flexible and scalable solutions for organisation. For example field mobility apps like Collector for ArcGIS and Survey 123 will have a more cost effective price point than the current Level 2 named user licenses. Esri Australia will be releasing a pricing model for the new “User Type” named user licensing in the very near future, please contact your account manager for more details on pricing. Esri have indicated that we can expect to hear more about similar User types named user licensing in ArcGIS Enterprise, in early-mid 2019. We will keep you informed as we know more through our Partner Network. If you need any assistance in relation to better leveraging your Esri licensing, implementation, upgrades or support, please get in touch….our Location team would be happy to help.